An area of wet rough grassland between the Kennet and Avon Canal and the River Dun. There are streams and ditches with marshy edges that attract a range of wetland species, which have included rarities such as Glossy Ibis and Dipper. Freemans Marsh is a nature reserve owned by the Town and Manor of Hungerford and is an excellent site for Water Voles. 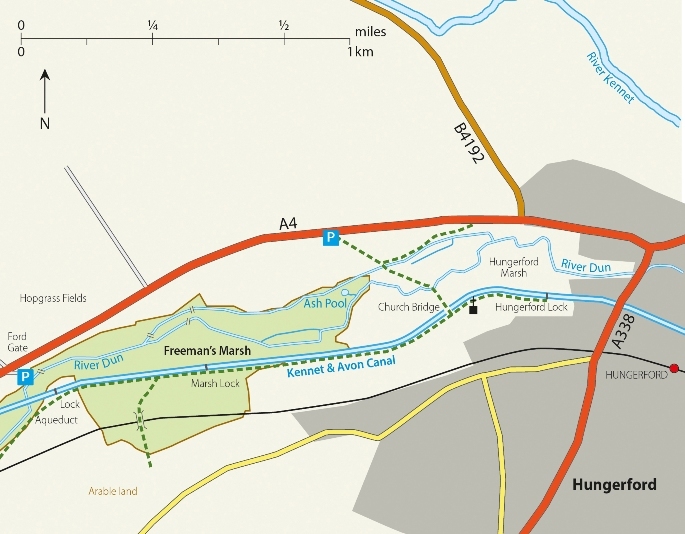 Access: Along the canal towpath from Hungerford or from the A4, where there are access footpaths, at SU 330689 and at Ford Gate SU320685, with nearby pull-ins. Residents: Grey Heron, Little Egret, Little grebe, Water Rail, Pied and Grey Wagtails, Cetti’s Warbler, Bullfinch, Reed Bunting. Summer visitors: Hobby, Swift, all three hirundines, the common warblers, including Reed and Sedge Warblers. Yellow Wagtail and Grasshopper Warbler occur now only as passage birds. Winter vistors: Water Rail, Lapwing, Snipe, Redshank, Green and Common Sandpipers, occasionally Curlew and Golden Plover; Redwings and Fieldfares, Brambling, Siskin, Lesser Redpoll.